Hotelogix introduces Management Dashboard on both Frontdesk and Mobile Hotel app. Hospitality industry is growing with a good pace and so is the competition within the industry. Today’s hoteliers need to have all the critical data on their business at place. It helps them view everything in one dashboard for quick consumption of information. They can save time, analyze current hotel performance, and can take data-driven decisions. Well, the answer is DATA!, and that too everything in one place! That’s the reason Hotelogix introduces Management Dashboard on both frontdesk and Mobile Hotel app. This is a collection of all critical hotel data in an usable format, needed by a hotel to analyze the past and current hotel performance, predict future and formulate strategies. This means that the key performance indicators of a hotel can now be tracked from a single dashboard without having to collect reports from multiple sources, and then compiling them. Here’s the list of reports that can be accessed on Management Dashboard. 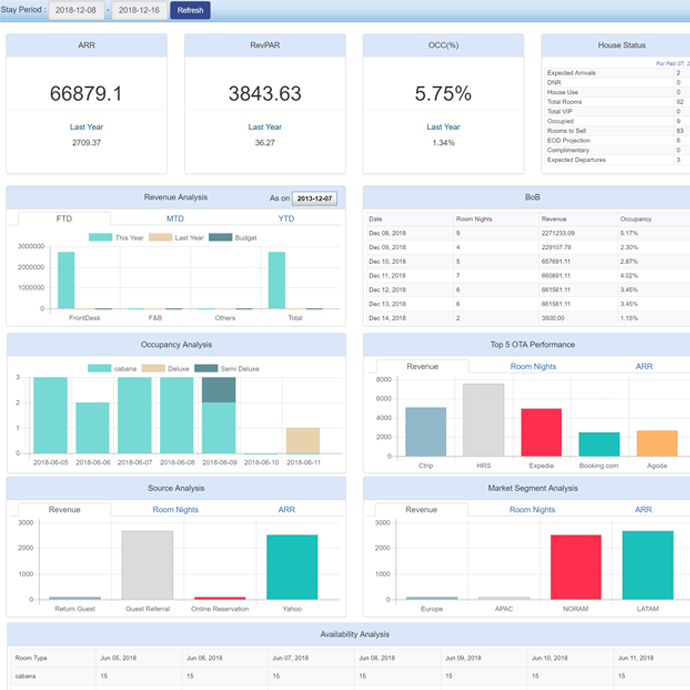 "Hotelogix introduces Management Dashboard for Hoteliers to take informed business decisions - Now view all critical data at one place. ", 5 out of 5 based on 2 ratings.